When smelting began at Amlwch is not certain. However the system has been described in a number of eye witness accounts. It is thought that the initial smelters were built alongside the Afon Amlwch in an area now known as Craig y don. The original building was 112 feet long by 50 feet wide. The river was diverted to make a small reservoir to be used in the works. 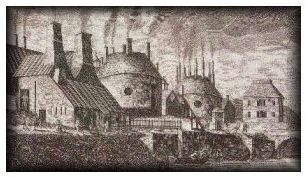 In 1797 Aikin described the smelting works. The two smelting houses, of which one belongs to each company, contain 31 reverbatory furnaces, the chimneys of which are 41 feet high. They are charged every 5 hours with 12 cwt of ore which yields ½ cwt of rough copper, containing 50% of the pure metal. The price of rough copper is £2-10-0 per cwt. The coals are procured from Liverpool and Swansea. 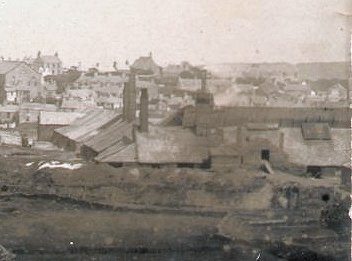 The smelting works at the end of the 19 th century. …The chimney or flue of such a furnace must be 55 – 60 feet high, rise vertically and be one square foot internally. This height is in no way superfluous, rather the intensity of the heat depends on it. There is no longer any doubt that the heat does not originate in the fuel but rather comes from the oxygen air that is a component of our atmosphere. In this air the fuel is so bound through a substance which the analytical chemist calls oxygen, after Lavoisier, that it cannot express its propensity to heat. This oxygen can, meanwhile, be removed at suitable temperatures by several bodies, in particularly carbon which is copiously contained in all combustible substances, and what results then, depending on how fast the separation occurs, is either gentle warmth or the most intense heat. Because all metallurgical smelting processes and, in particular, the copper smelting process, demand very high temperatures, one has to endeavour to construct a smelting furnace which allows for the decomposition of the largest possible volume of oxygen air in the shortest possible time. …I have already said above that calcining furnaces are built following the same principle as the smelting furnace and that they only differ themselves in that the hearth is horizontally bricked up with fire-proof artificial stones. Yet I have to note that instead of the openings which Schlüter presented in his drawing as the tap hearth and as the discharge opening, through which the slag is removed, there are two large openings affixed which can be closed with iron trapdoors and serve to introduce the ore, and following that to stir it. In such a furnace two to three tons of ore 40 – 60 hundredweight are shovelled through both of the openings just described, evenly spread about and initially subjected to a roasting heat, which, however, towards the end of the operation is greatly increased. During this time the ore is frequently stirred with iron rods which are affixed to rollers on the front of the furnace in order to control them better. The time which is required for sufficient Calcination of such a quantity of ore cannot be set because it depends on the degree of roasting which the ore has had; usually, though, 12 hours is sufficient. Actually it often does not require even that much time to separate off all the Sulphur present, which can be separated by this method. 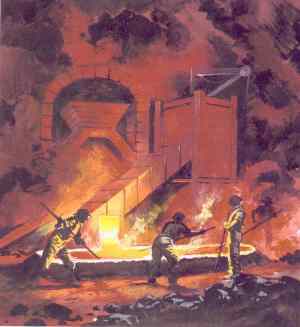 At this point the calcined ore is brought to the foundry and smelted with the addition of flux in the following way. To 12 hundredweight of ore, which constitutes a load for this kind of furnace, 42 hundredweight of copper slag and two hundredweight of carbonized anthracite or coke are added. The anthracite is carried in first, then the ore and over these comes the roughly broken up slag. Everything is thrown into the outlet using a shovel; For the opening, found in Schlüters drawings through which the ore should be placed into furnace with a funnel, is not found on a copper smelting furnace, and the outlet is stopped up with a door of clay and cemented shut. A roasting heat is applied for about one to one and a half hour so that, if there were still Sulphur present in the ore, this could completely volatilise. The temperature of the fire is raised to the highest degree and maintained at this level, uninterrupted, for two to three and a half hour, which is why the anthracite is always added in small portions, so that no noticeable decrease in temperature takes place through adding too great a quantity. Then the door of the outlet is taken away to check the state of the smelting, which should be so far along that the mass is nearly fluid but the slag is still semi-solid. The smelter then throws a few shovels full of anthracite over the melting mass, closes the outlet again, increases the heat and keeps it at the highest temperature until the smelting is complete. This takes about six hours from the beginning of the operation. During the smelting the tap hearth which consists of a frame of iron plates six feet long, three feet wide and 18 feet high, is put in order. The forms into which the whole molten mass will be poured are prepared in these using damp sand. The shape of the forms is arbitrary; however, one usually gives the shape of an inverted pyramid which has an upper surface eight inches wide. There are as many of these shapes cut into the sand as space allows, with a space of four inches between each one, in which a communicating gutter is cut so that the excess molten material from the first can flow into the second and that from the second into the third, etc. The form which is connected directly with the tap is cut out a little wider and deeper than the others because it mainly takes the metallic part, while the others, in contrast, are filled only with slag. When the ore is sufficiently melted, then the furnace is opened, which is achieved by cleaning away the clay which has sealed the tap hole or mouth of the furnace with a scraper after which the molten mass runs into the forms. When all the molten material has run out of the furnace, the furnace is charged anew by throwing little, moistened pieces of anthracite into the hearth so that the heat drops, whereupon one puts in the hard coal and other ingredients. And so the smelting operation continues, uninterrupted, and one puts 40 hundredweight through the furnace in 24 hours. When the mass in the tap hearth is suitably cooled down, the pieces next to the tap hole are removed and the slag is separated out from the metallic part. This is achieved very easily with a few blows of the hammer. The slag is thereafter brought to a special place where one breaks it into bits in order to get out the stone granules which might still be there, although this does not often occur because the smelting proceeds very completely, and the mass remained in the fluid state in the furnace long enough so that the metallic portion could separate out from the slag. These metallic parts have a blackish green appearance, are granular and compact like basalt when broken and sound like it if one hits them with a hammer. The reguline or metallic portion, which is in the same state as that which the people in our copper works call Sporstein, is broken into pieces the size of a fist, and 60 hundredweight of it is brought to a special furnace, which has the same construction as the smelting furnace, with the exception that, instead of a tap hearth, a water container is brought near the furnace and is set up so that fresh water can flow continuously. In this furnace the stone is roasted for 12 – 16 hours; the heat is then gradually increased in intensity so that the mass melts, and in this state about a hundredweight of anthracite is thrown onto the melting mass. When everything is quite fluid, the slag which has been produced on the surface is removed. A lead gutter lined with clay reaches from the tap hole to the water container. The fluid stone flows along the gutter into the water where it is granulated into pieces the size of beans through the constant movement of the water. The purpose of this operation is first to fluidise a part of the Sulphur through the long roasting and then, through the subsequent granulation, to produce a greater surface area in order to be able to dislodge the Sulphur more effectively. After the granules have dried somewhat, they are put into a calcining furnace and calcined with very active stirring for 26 hours at a temperature as intense as one can use without melting the mass. Then the granules are melted in a smelting furnace, which does not have a tap hole and whose hearth is so constructed that the greatest depth is in front of the outlet. When everything is sufficiently melted, the slag is removed, and the molten mass is emptied into iron boxes washed out with clay using large ladles. The boxes are 16 inches long, 11 inches wide and 11 inches deep, and one places a suitable number of these in a half-circle in front of the furnace. Two workers, who have pulled moistened sleeves of rough linen over their arms to keep off the heat, alternate in taking a shovelful of the material from the furnace and fill the boxes one after the other, in that each one pours a ladleful into a box. While the last box is being filled, the metal in the first has solidified to such an extent that a new layer can be poured on to it without binding with the first. So the boxes are filled, one after the other, producing a number of thin cakes which are approximately 1/4 inch thick and which can be separated when they are properly cooled. The purpose of this procedure is to give the mass, which is now in the state of a very impure black copper and which one can no longer break into bits, a large surface area so that the pieces of Sulphur still present can be more easily volatilised. For this purpose the cakes of black copper are put in another, but similarly constructed furnace, where they will be roasted for 16 hours with the heat increasing in measured increments, so that the metal melts very slowly. After everything is fluid, one allows the metal to simmer for a few hours so that the calcined parts can scorify, and one removes the slag through the outlet. Then one lets the fire die down a bit and pours the fluid black copper into iron boxes as before. The metal is now in a state where it can be purified. This, however, does not take place in the same way as in our own copper works but rather in a way which distinguishes it, in that the copper at these works is made completely pure immediately so that it can be worked by coppersmiths without further refining. To achieve this one places the cakes in the refining furnace, which is just like the previous furnace, and roasts it for 16 hours, gradually increasing the temperature so that the copper melts slowly. When this has happened, 25 to 30 pounds of lead is put onto the three tons of copper which one will refine all at the same time. Then one maintains a strong heat for several hours so that a proper slag can form and the impurities still found in the copper can dissolve out. The slag is removed from time to time so that the calcination of the metal pieces being scorified can proceed even better with the introduction of fresh air. When the scorification is coming to an end, enough coal dust is thrown on to sufficiently coat the surface of the metal. Then the refiner shoves a tree in the furnace and presses it into the metal as strongly as he can. Because one uses elms or young oaks from four to six inches in diameter which have been freshly cut or left to lie in water to keep them damp, a violent bubbling occurs in the copper when one pushes the tree into it. This is allowed to continue for several minutes. Then one throws coal dust over the copper again and the bubbling recurs. This process continues until the copper has reached the requisite degree of purity. One ascertains this by removing a little copper with a small test spoon. As soon as the copper solidifies, it is quenched in water and breaks into bits. If the colour is a bright brick red, and the break shows that it is fine-fibred and as glassy as satin, then it is of the required purity. If, on the other hand, it is blistered inside and dark red, then one has to carry out the previous procedure, which one calls phlogistics for a longer period of time. One must even add some lead, if the metal is still not ready, whereby, however, the phlogistics must always be repeated. When the copper has reached the desired purity, it is either poured out as cakes in the previously described manner, granulated or poured out in small bars, which are formed like bars of sealing wax and are usually called Japanese copper in Germany but should actually be called lacquered copper because the English word japanned copper signifies this. Also it is generally known in England that all the copper produced by this firm is produced in the country and is used in business with the East Indies. The cakes, most of which are treated in the rolling mills of the company, are usually one and an half inches thick. In order to maintain this thickness, it is necessary that both of the workers who do the pouring shovel as quickly and at as regular intervals as possible so that when the first one has poured out his ladleful, the other one can follow on immediately so that the metal does not solidify before the next ladleful arrives. The boxes are washed out with clay beforehand and the bottom cakes are only poured thinly because they have to be melted again. When the pouring is finished, the boxes are cooled in a tank with water. Then the cakes are taken out, trimmed at the edges, stamped and numbered and sent off from the works. Granulation occurs in the following way. A cylindrical container of copper which can be brought up again afterwards with the help of a crane winch is let down into a round 12 foot deep tank, through which water continuously flows, A copperplate dome is place over the tank, with an opening on one side for the ladle carrying the metal. This hole must, for this occasion, be much smaller than the hole used in pouring of the plates because the metal can only be poured into the water in small portions, on account of the violent explosion, which would occur if too much metal hits the water at once, and because too much copper ladled out at once would also solidify in the ladle. For this reason, this process is carried out by only one worker. He scoops up some copper, puts the spoon through the opening of the dome over the tank and gradually shakes the copper into the water where it sinks to the bottom producing crackling sounds and frequently, blue flames. The copper falls two to three feet through a column of air before it reaches the water and by doing this takes on a form which has a distant resemblance to the texture of a feather. One therefore calls these granules feather-shot to distinguish them from the rounder granules which one gets when the copper is poured directly into the water. Because the granulation takes a lot of time, one has to ensure that the metal in the furnace does not get too cold; to protect it against calcining, the surface is dusted with coal dust. Granulation was used everywhere in England in the preparation of brass, for which it is also undoubtedly more suitable than refined copper because the granules consists of very thin plates which can mix with the calamine better and offer a larger surface area for the developing zinc vapour to penetrate. However, more of this when I discuss brass production. 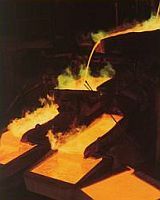 The so-called lacquered copper is poured in the form of ingots. Several such forms are fastened to an iron wheel which is positioned over a tank filled with water, which is likewise positioned very close to the front of the furnace. When the metal reaches the necessary refined state, a young lad, using a paint brush, paints the form with oil, and the pouring master, using a spoon which holds just about what the form will hold, pours the metal in the forms. In the meantime another worker holds ready a container with water which he pours on the copper in the form; As soon as the copper solidifies, he turns the wheel so that the bar cools itself completely in the water in the tank. The copper is poured into the form next to the first form following the same procedure; however, before one paints the form with oil it is first carefully dried out with a cloth. Otherwise the water mixing with the molten copper could cause a dangerous explosion for one of the workers. One uses the forms in rotation so that there is enough time for them to cool again before introducing molten copper; otherwise the copper would stick to them. This is the simple process which produces a quality of copper which one values so much abroad, which, however, the English smelters who produce it regard as less pure than cake copper. The oil with which the forms are painted before each casting serves to hinder the effect of oxygen from the air as well as the cooling water and keeps the outer surface completely metallic. The outer surface also becomes shiny through the sudden pulling together of the particles in the same way that any metal takes on a higher shine when its surface particles are brought closer together through pressure, under the coin press, for example. The working up of the precipitated copper is less difficult than the procedure for the ore. At the first smelting one places eight hundredweight of precipitate with four hundredweight of slag and half a hundredweight of anthracite in the furnace, takes away the slag when everything is well melted and pours the metallic part, which is very impure black copper, in iron boxes to make cakes. These undergo a 24 hour roasting and are then slowly melted and poured out. The same operation is repeated again, after which the metal is sent for refining. These then are the English smelting and refining processes, which I cannot leave without first explaining a few operations which are not common for us and without making a brief comparison between these and the normal smelting methods used in Germany….